MTV Geek talked to Jen recently about her upcoming Avengers: Solo series with artist Roger Robinson. 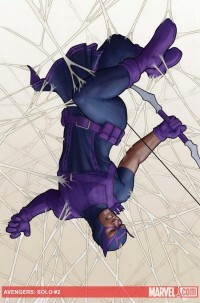 Geek: Clearly, Hawkeye is the star here… What draws you to him, as a character? JVM: I love his combination of rakish, brash bravado and straightforward honesty. His skill set is so much fun, and his sense of adventure makes him a delight to write. He’s also kind of a novelty for me because so many of the costumed characters I’ve written are marked by some real distinction between who they are in and out of costume, so to speak. To me, Clint and Hawkeye are pretty much the same guy — it’s not as if the mask lets him say things he wouldn’t otherwise or he’s got a ‘day job’ that’s in conflict with his role as a hero– when Clint suits up, he’s putting on his work clothes. It’s kind of cool to work with someone for whom that part isn’t a huge source of tension. The five-issue Avengers: Solo debuts in October! This entry was posted on Monday, September 12th, 2011 at 8:10 pm	and is filed under News. You can follow any responses to this entry through the RSS 2.0 feed. You can leave a response, or trackback from your own site. Best of luck on the new mini-series, Mrs. Jen. I’m looking forward to reading it. I have no doubt it will be excellent. I really appreciate you using Angela Golden as a key character in this series Ms. Van Meter. She maybe an obscure character but there’s something about her that really caught my imagination when Mark Gruenwald used her in his Cap run back in 1994 and I was always wondering about the character’s fate. I was so relieved to see her back and I really like your interpretation of her. I hope somebody uses her again sometime soon. Thanks again.